When we, at Safe, say that the Tester transformer is our most important, that’s only half the story. 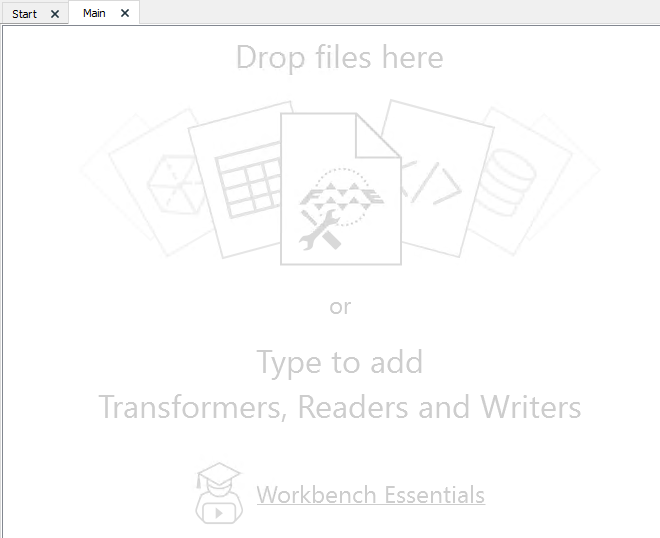 That’s because test clauses for the Tester (#1 most-used transformer) are defined in a dialog that is used in multiple places in FME Desktop. 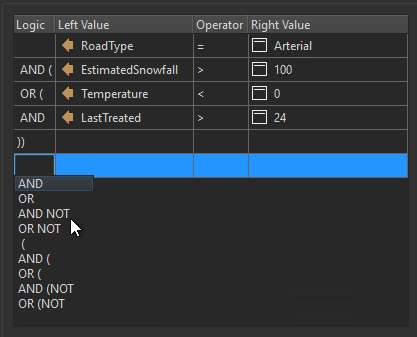 It’s a key part of the TestFilter (#7) dialog, used in the Data Inspector (under the Filter function), and appears in the Edit Breakpoints dialog (setting conditional breakpoints) as well. 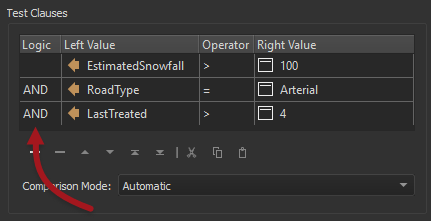 Finally, it’s used in any transformer that allows conditional parameter values; for me, that’s mostly the AttibuteCreator (#2) and AttributeManager (#3). The main part of the dialog that has changed concerns complex tests, with multiple clauses. Let’s take such a scenario and see how it’s changed. A composite test consists of a mixture of AND and OR logic (and maybe more) tying together a series of test clauses. What we’ve done is removed the need to match each clause to a number; the logic is now alongside each row. Additionally, it’s all a single mechanism now. The logic column allows you to manipulate test clauses in the same way, whether the overall set is simple or complex. As an added benefit, the Composite test gains exposure. You are more likely to find that composite capability now than before, and that’s a great thing for new users. 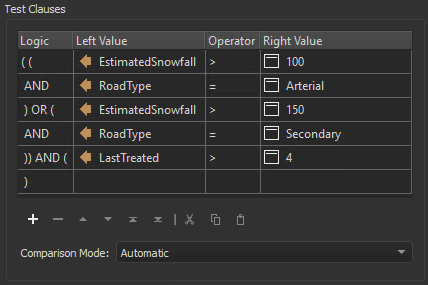 We’ve been thinking about new users quite a bit for FME2019, and believe that these changes will make it easier for them to understand this dialog. 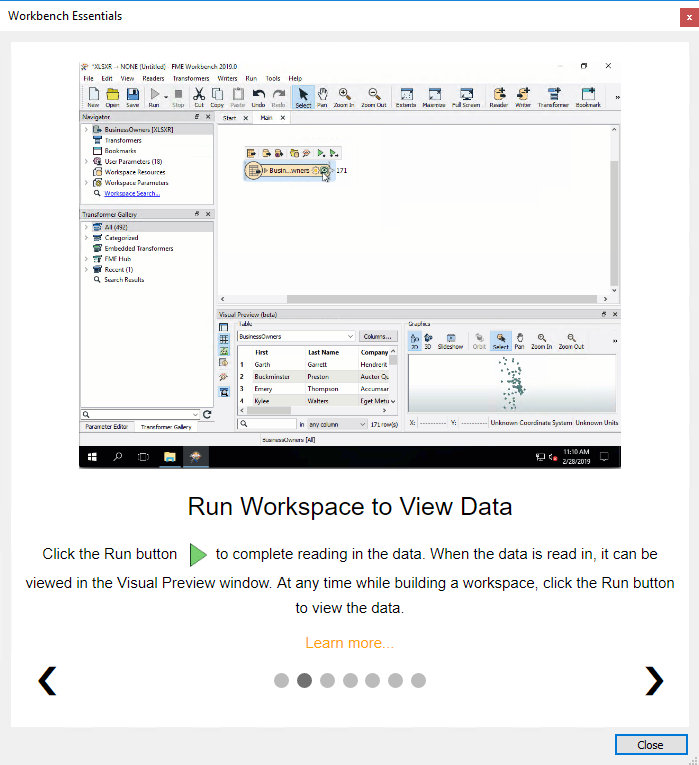 For example, a user constructing their first workspace should be able to find this capability and grasp the concept of composite tests much more easily. And a user who inherits complex workspaces from a colleague is much more likely to understand what is happening. There are AND and OR operators there, plus the NOT operator, which is a direct replacement for the “negate” column that used to exist. …because I can add extra brackets if necessary (and I often add extras just to be certain of my logic). It might also have occurred to you that the order of the logic is more important in 2019. 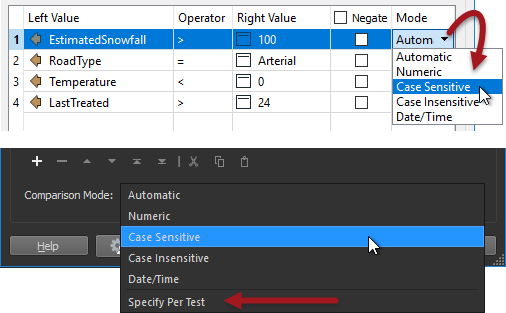 …then x and y must be consecutive test clauses in the dialog. Basically, the old text box was a separate entity and could refer to rows in any order; but now that individual rows make up the composite logic, their order is all-important. I say “by default” because it is possible to change that back to give per-clause modes by using “Specify Per Test”. At the very start, I mentioned that many different places use this dialog. They are all updated for 2019 and, as far as I can tell, this takes place without any action on your part. You don’t – for example – need to upgrade the Tester transformers in your workspace to get the new interface. But back to test clauses, we’re hoping that these changes benefit existing users too. It’s always nice to simplify things. Interestingly, Dale says that the dialog is less “clickalicious” than before, whereas I feel it’s a bit more “clicky”. Who’s right? Well, I await your feedback with interest. 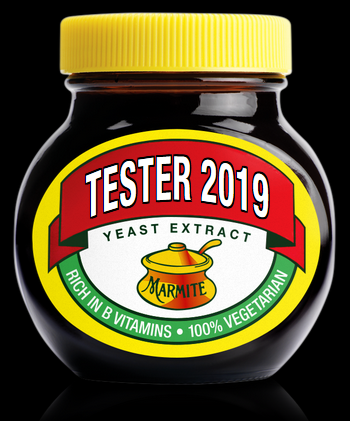 It feels like a “Marmite Update” to me, where everyone is going to have a strong opinion, so I expect to hear a lot of comments! Note: Marmite – for those not in the know – is a sticky, black foodstuff, usually spread on toast. The joke is that no-one can possibly have a neutral opinion about it! By the time you read this, the official launch of FME 2019 will be just a matter of days away, and the FME World Tour for 2019 will have already started with FMEDays in Germany. The tour continues, around the world, until mid-June. There’s still plenty of time to sign up and attend, so please click on the graphic above and check out when we’ll be in your vicinity. For the composite test clauses, would it be possible to have an ‘echo’ of the full test shown. Also the previous version would allow you to repeat elements (1 and 2) or ( 3 and (1 or 2)), in the new version, would you have to repeat that test if you couldn’t reorganize the clauses? If you can do this you will have the wisdom needed to truly enjoy Marmite. Or not.